A common argument claims that cutting the length of time that people can collect unemployment benefits forces people to find jobs faster. If this were the case, we would expect to see the share of people with jobs increase after cuts went into effect in states that cut unemployment insurance. 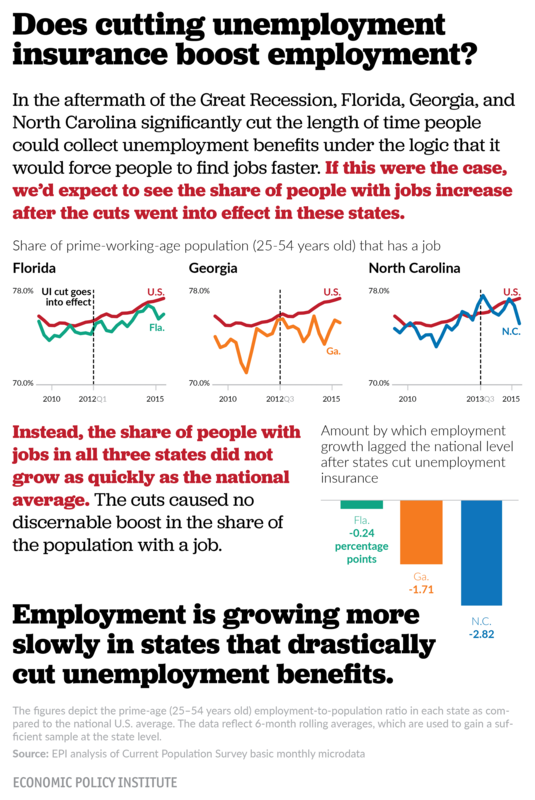 Instead, the share of people employed actually lagged the national average in the three states that most drastically cut unemployment insurance benefits after the Great Recession—Florida, Georgia, and North Carolina. While North Carolina’s prime-age employment-to-population ratio started out above the national average, it fell to more than 2 percentage points below the national average after drastically cutting unemployment insurance. Both Florida and Georgia started out below the national average when they made cuts to their programs, and they have continued to fall further below the average in the meantime. This casts serious doubts on the theory that a more restricted unemployment insurance system boosts a state’s labor market.